Mark Tyler was outstanding at Wembley for Posh in May, 2000. Peterborough United were promoted after winning the League Two play-off final 1-0 against Darlington at Wembley in May 2000. 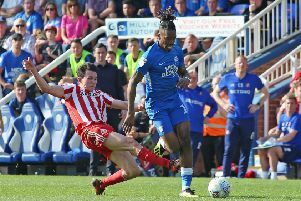 Fry calls it the ‘promotion the Posh fans never talk about’. He recalled: “Posh were promoted in 2000 and to this day I don’t know how we did it. “It still irritates me that it’s the play­-off win that fans rarely talk about. “We’d sold Matthew Etherington and Simon Davies that Christmas to raise money so to go on and win promotion was a hell of an achievement. “We didn’t deserve to win the final, but Mark Tyler was brilliant and Andy Clarke grabbed a winner. “But I was never going to get any praise from the noisiest supporters, or from the press, as they both turned against me. “It hurt me and my family that a supporters group (PISA2000) was set up just to get rid of me from the club. “It irritated me that the local paper printed my contract details as whatever I took out of the club I had earned, because of how I had fought to keep the club afloat at great personal expense. “Some of the things said about me by certain fans were cruel lies. I didn’t enjoy my first 10 years at the club because I couldn’t achieve what I set out to achieve and because the abuse I received was over the top. “I accept that bad results will make fans hammer you, but it became very personal. “While others who had caused problems were ignored, I was machine-gunned by criticism. It was always my fault. “When I first realised the extent of the club’s financial problems in 1996 I didn’t expect to last a month. “Ten years later I wished I hadn’t. ”I didn’t enjoy those first 10 years at the club at all. There was too much fire-fighting and too much worry. “There were times I could have walked away, especially in the early days, as promises made to me didn’t materialise. “But I didn’t because I felt I had come in under false pretences and make things right. “Many of the games we played came and went in a blur. When the end came for me as a manager it was a relief. “Keith Alexander, a manager who had great experience of delivering success on a shoe-string, arrived and I felt the team were in good hands. Find out how in next Thursday’s Peterborough Telegraph (June 2). Fry’s top transfer deals as a manager will appear on line tomorrow (May 29). Barry Fry has managed Posh in more Football League matches than any other boss. His first competitive game in charge was a 1-0 defeat in a Division Two match at Bristol Rovers in August 1996. His last competitive game in charge was a 1-0 defeat in a League One match at Port Vale in May 2005. In total Fry managed Posh in 414 League matches, winning 134, drawing 119 and losing 161. Darren Ferguson is second in that list with 320 matches. Posh scored 536 goals in Fry’s era and conceded 544. Fry’s Posh collected 521 points, 41.95% of the points available. That ranks him as the 25th most successful Posh manager in the club’s Football League era.